The British Virgin Islands are located at 18º 30′ N, 64º 30′ W, a few miles east of the US Virgin Islands. They consist of the main islands of Tortola, Virgin Gorda, Anegada and Jost Van Dyke, along with over fifty other smaller islands and cays. About 15 of the islands are inhabited. The islands are of volcanic origin, except for Anegada, which is composed of limestone and coral. The total area of the islands are 59m² or 153km². Mt. Sage on Tortola is the highest point at 1,740ft or 530m. Locals recount that Christopher Columbus named the island Tortola, meaning Turtle Dove in Spanish. In fact, he called it Santa Ursula y Las Once Mil Vírgenes (after the martyred Saint Ursula and her 11,000 Virgins), then shortened to Las Virgenes (The Virgins). The Dutch called it Ter Tholen and when the British took over the name evolved to the more pronounceable Tortola. 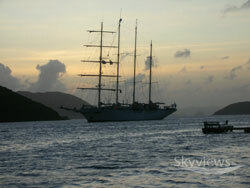 Fun things to do in the BVI: it’s a great place for cruising and the yachting community. Go diving, whale, dolphin, bird and turtle watching, hiking and walk nature trails, visit places of historical importance and please savour the impressive granite Baths (in Virgin Gorda). Going to the British Virgin Islands and wondering where to stay, what to do, where to eat and how to get around? We’ve got you covered with our list of hotels, restaurants, activities, car hire, shopping & more. Browse through for more details. Weekend events which includes kiteboarding and SUP classes and competitions. The one Caribbean Regatta that has something for everyone who attends. Whether you race, cruise, practice or just come to party, we have it all! Race & Cruise your way through the BVI. The weeklong BVI Spring Regatta & Sailing Festival takes you throughout the beautiful British Virgin Islands. Starting at Nanny Cay, the Sailing Festival is two days of warm up racing. 54K ultramarathon on Tortola in the British Virgin Islands with only 22% on the flat, the rest on hot and humid hills with 12,000 feet of elevation change. A costumed party takes place where live and local music, delicacies and dance is put in the spotlight. The BVI Emancipation Festival is a territory-wide holiday. There is evidence of an Amerindian culture as far back as 1500BC, but it is known that the Arawaks, an organised peaceful group were on-island by 100BC and stayed until usurped by the fierce Caribs in the 1500’s. Christopher Columbus sighted the islands in 1493 but never settled them, leaving it to the English, Dutch, French, Spanish, and Danish to then elbow for control of the region, thus creating space for the Golden Age of Piracy during the 1690-1730’s, Blackbeard (Henry Morgan) being one such. The hidden bays and ideal sailing conditions made it attractive for such activities as well as ‘privateers’, but by the 1600’s the British had firmly taken control. The traditional music of the British Virgin Islands, ‘scratch bands’, is called fungi after the local cornmeal dish with the same name. Its unique sound is a fusion between African and European music, so important, that it is incorporated into the school curriculum! 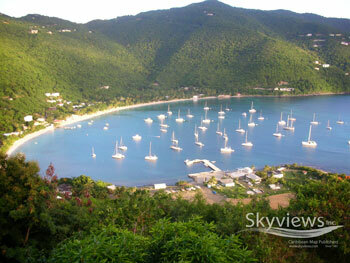 Today, the BVI is a haven for the sailing community, with its calm waters, and steady breezes. It is also a financial haven with 50% of its income deriving from this sector, and is said to hold 45% of the world’s off-shore companies. Tourism accounts for another 45% of its income. It is a British Overseas Territory with its own Parliament.